Any glaring problems with this Cyrillic character set? I've been working on this sans text face for a while now and have recently added a Cyrillic character set to the existing Latin and Greek sets. I realise there is always room for improvement, but I've had a lot of support elsewhere and am generally satisfied with the overall look and feel of the font. The purpose of posting this is principally to ensure the newly-added Cyrillic characters are correctly formed and spaced (please note that I have not started applying kerning yet). I've attached a PDF showing all three scripts at various sizes. Whilst my focus here is on the Cyrillic characters, I'd welcome feedback from anyone who spots an issue elsewhere that needs to be addressed. ч is too wide, and I'd recommemd connecting the curve part to the stem like in a (i.e. at an angle). ф, м are too heavy (dark). The top horizontal strokes of л, д can be wider, no need to compress the upper half of the counters so much. 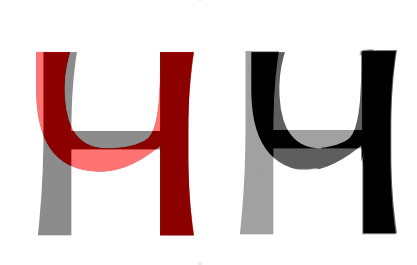 Offset the tooth in д, ц, щ a bit more to the right, and make the teeth longer still. Also, I'd open up the overall spacing of the Cyrillic. Also, I find the "a" disturbingly wide, in both Latin and Cyrillic, but that may be a conscious choice. I second Twardoch's opinion about ч, м, л and descenders. Regarding д, I agree that top counter needs to be wider, but Candara's approach seems a bit strange to me. Also note that ь and ъ are not directly built from a в without the top lasso. You may experiment doing their bowl a little taller. And for в itself, your design make the bottom bowl appear smaller than the top one in small sizes. Alexander, Adam, Igor... I'm really sorry for the delay in thanking you all for your insight and suggestions. I've had to take a step back due to illness and work on this project has ground to a halt. I take everything each of you said on board and will post an update as soon as I am able to resume work. Hey Steve, I really like the general feel of the typeface, I think it's very original and warm. You have everything already worked out already. The only thing I can comment is that I had a strange feeling when I first read it. The Latin version looks wide for a regular typeface. Is that what you where looking for? What's the main objective of this work? Print, Web, Display, Text, etc? Many thanks to those of you who commented on the Cyrillic glyph set. I'm considering returning to this project after a very long and enforced break. I haven't made these changes yet but, when I have, I'll upload the revision. I'm also hoping to complete the italic version, which has also been gathering digital dust for around 15 months. I've attached a PDF showing what I have thus far and would really appreciate any observations and suggestions for improvement, particularly with the Greek and Cyrillic, which feature some unusual letterforms. I'm an amateur at Cyrillic, but I'd say the /zhe is jarringly zigzaggy, the /shcha's descender looks crumpled, the /hardsign needs much more space on the left side, the /el is too narrow, and overall the rhythm of the Cyrillic is less attractive than the Latin. I think the spacing and kerning needs to be tightened. I like your Latin! Though there's also the occasional place where I find the space between two letters too large, e.g. after /l. Thanks, Christian... lots of work to do, both with this and the roman version. After such a long break, it's difficult to get back into the swing of things, but I think this face has been too long in development to abandon. I think the right sidebearing of /epsilontonos is off.